affected: what began while I was asleep they experienced in real time and particularly for New Yorkers, that day is an event they cannot help but relive. Every year on September 11, conversation tends to turn toward that day, but it's easy to forget that there are those who have never stopped thinking about it. exploration of grief, love, pain, transformation and ultimately, hope. to tell this story as a documentary? D: Were there any unique challenges for you in terms of working in documentary instead of fiction? origin of the film actually came out of that; I had a thought that there would be a museum there one day, and my original inspiration was to create an installation using just the time-lapse to allow an audience to be in a space where the buildings would be rising up around them. D: This was a decade-long project; were there ever any moments where you were unsure if it would ultimately come together? JW: I never had an internal feeling of self-doubt as to whether or not the film would ultimately get finished, and that was in part because when I started it, I felt like it was so important to do, but also, it had to be done. I will say that certainly along the way there were times where I thought, "If I don't figure out how to raise money at a certain point here, we may have to take the cameras down." But there was something inside me that just never really entertained that that would ever happen, in part because I started the film as a nonprofit organization (Project Rebirth), and I had an incredible board of directors and team working with me; I just had a trust and a faith that we would somehow figure it out. D: By now, the images of September 11 are so iconic and so easily recognized. What was your process like for deciding how you wanted to personally convey those events? JW: I felt that any images that I would show of the day itself would be familiar to people, but more importantly I felt that there was not an image that I could put in the mind of the viewers that could take the place of their own experience or that could be better than their own feeling of where they were on the day. So I chose to not show any images, for two reasons: I wanted the viewers to fall into the lives of the five stories I was telling from the perspective of watching them talk about going through it, and I wanted the viewers to transport themselves to that day in their own minds from wherever they were at that point in time. Everybody had their own images for the day and I just realized that the imagination is often much stronger. So by going to black and not showing them, but just hearing the audio from the radio, it felt to me like it allowed an audience to put themselves more there in their own experience. respects have a more universal feeling of what people experience when they go through loss. It was always about capturing the essence and the truth of it as intimately as I could possibly do it. so messy and complicated and you don't always know how to talk about it, but these characters open up so much. How did you find these five people in your film? JW: I had an idea that I wanted to find ten types of people who would have been affected by the day: a police officer, a firefighter, someone who was on the impact floor, someone who had lost a parent-and I tried to divide it up that way. With the help of a very good field producer, Danielle Beverly, we began to explore, through family groups and The New York Times obituaries, various people whom we could potentially approach to be in the film. From there, however, it was a very unscientific approach; it was very organic. I knew I needed to find people who were very open emotionally and also very engaged in the notion that the project would be at least seven to ten years, so they had to be really committed to doing the film. you have when you wake up in the morning and when you're taking a shower. I'm not interested in sound bites, I'm not looking for anything in particular, I'm just interested in having a conversation, and I just want to listen and talk with you." So the interviews were often anywhere from three to five hours at a time, and they were an exploration of their lives as it related to their loss. D: How did they react to watching their own grieving processes on film? JW: That part of the experience was very interesting. I told them I didn't want them to see any of the film until the end, so they never saw themselves through the 10 years as I interviewed them because I didn't want their reactions to themselves to change the way in which they moved through the process of being interviewed over the years. So when I finally showed them the film, the great thing about them seeing it was that each person turned to me and said, "I can't wait to meet the other four," which is really an amazing reaction. D: What has the audience reaction been like? and no one left at the end; it was really quite emotional. It was like that through Sundance and it's been that way throughout. It's been pretty moving to have people respond to it and go through a series of emotions in the film. In going through the struggle with it, I'm hoping by the end of it you really do have a feeling of hope and are inspired by how these characters got through it, so I'm happy when people feel that way. D: What was your biggest technical challenge with your film? JW: The director of photography, Tom Lappin, figured out how to build these four-foot by six-foot boxes that are hanging off the building, with 35mm movie cameras hanging inside them and an intervelometer that tells the camera to shoot a frame of film as it's taking in the light, which is changing all the time during the day, so it's pretty complicated. 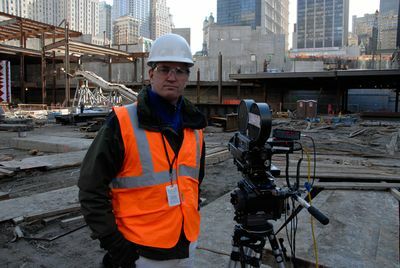 It might not be as complicated if it was a week or a month, but the cameras have been up and running for almost 10 years now, so the technical problems we've tended to run into have been like what you'd run into with a car. It's just a long time to have any mechanism continuing for a long period of time. In the beginning, the technical challenge was, "Can we do this? Can we actually sustain and keep the time-lapse running and can it be good? Can it capture what we're trying to capture but also have a sense of evoking a feeling from the site?" We were able to do some preliminary tests, jump right into it and figure it out pretty quickly. D: What are your ultimate social goals for the film? started to realize that the film could potentially help people. About three to four years into the process I met with the president of Georgetown University, my alma mater, and he invited me to show a portion of the film to a group of academics, who all pointed out something that I just didn't know: there hadn't been a record of grief over this period of time that had existed on film. So what I and the chairman of the organization, Brian Rafferty, started to realize was that there was a real opportunity to use the film to allow people to see others going through grief. So we have an educational initiative that's going in different directions to accomplish the same thing: teach people about grief, and prepare people, especially first responders in the event of a natural or humankind disaster, that the aftermath is a very long one and that while recovery is a long process, it can also be a very hopeful one. We have a program starting in the fall with the cadets at the NYPD. They'll be required to go through a course based on Project Rebirth and based on the film. We're also doing a project with the Arlington Fire Department in Arlington, Virginia, which has one of the best programs for PTSD teaching for firefighters. In the New York/New Jersey area we're beginning an educational initiative that we expect to expand, teaching psychologists using the film how to teach students about grief, and in addition to that, we're just beginning educational projects for high schools and colleges. So it's a multi-pronged approach to getting underneath and allowing people to understand the messiness and challenges of grief-but also that there's hope at the end of the road, because it can be very dark for people, especially in the early years. While the grief may never quite leave you, it doesn't mean you can't, as Tanya says in the movie, have joy in your life. D: Do you have any advice for beginning documentary filmmakers? JW: It can be very hard to make a film, and it requires a lot of energy and focus, so I'd like to encourage people to just listen to themselves, kind of what the Jesuits call "discernment" of what's going on within them and the feelings in their lives about something. If they're feeling something really strongly, go after it, and by any means figure out the way to get the film to happen. This film took me ten years, and the way for it to happen is to have it feel incredibly personal. Rebirth premieres August 26 in Los Angeles and August 31 in New York City through Oscilloscope Laboratories. 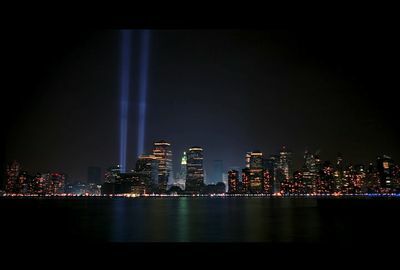 The film airs September 11 on Showtime.